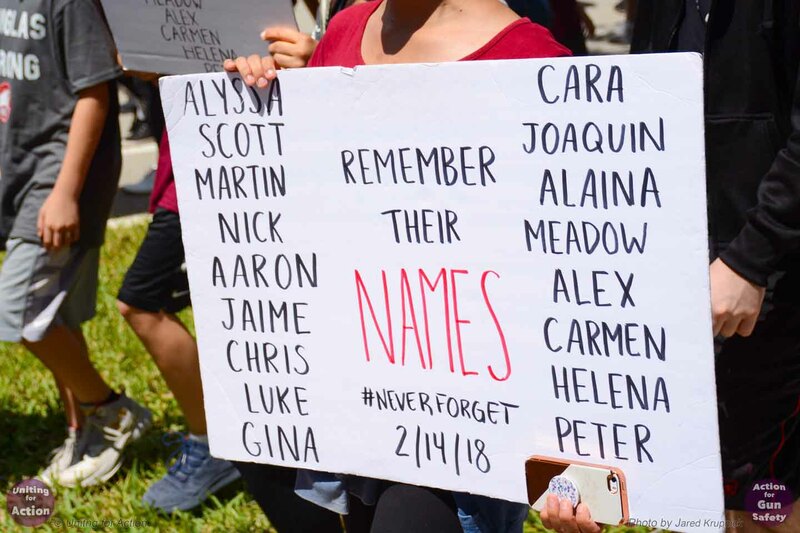 students and families in Parkland, Florida. A student leaves a flower for her dead friend in Parkland, Florida. Photo taken by the creator of Action for Gun Safety, who lives 20 miles from Parkland. In order to achieve gun safety in the face of historically fierce challenges, we must scale up our solutions to overcome the entrenched political and economic forces that oppose us. 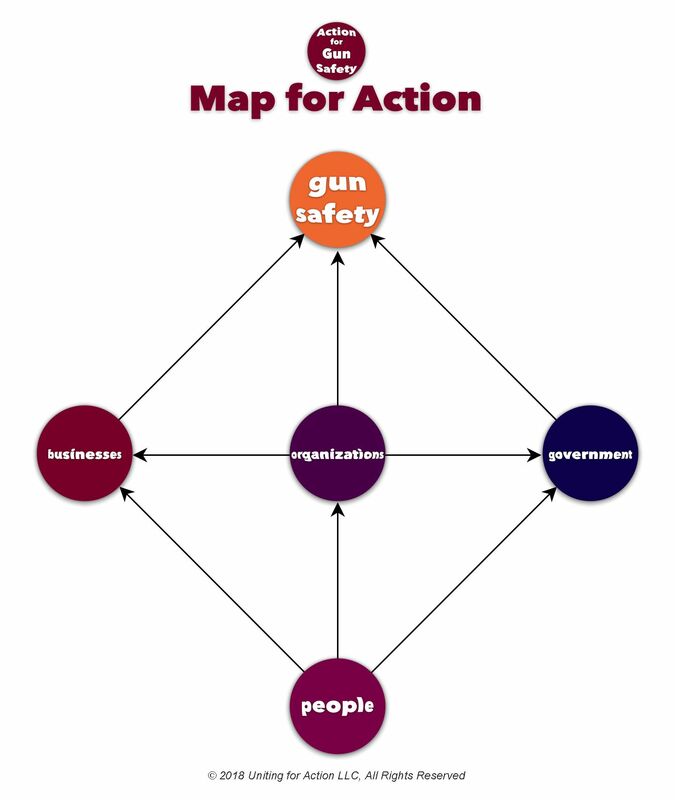 Action for Gun Safety – this website along with the associated work being done behind the scenes – has been created by Uniting for Action to facilitate the scope of the coordination, cooperation, and collaboration required to achieve the results we seek. Hundreds of thousands of people Marched for Our Lives across the country. Hundreds of thousands of students walked out of their classes across the country. Even though most of those people would be willing to take further action, the vast majority of them have been relatively idle since those organized efforts because we, as a society, haven’t provided the plans and systems to organize and coordinate their actions in ways that create tangible results. Action for Gun Safety has been created to effectively marshal and organize all the resources we have to effectively address Gun Safety. Parkland student survivors fill the bleachers behind the stage at the March for Our Lives in Parkland, Florida. Photo taken by the creator of Action for Gun Safety. We’re using this website to provide a public face for our behind-the-scenes efforts. Here we’ve provided you with an easy-to-reference summary of leading national gun safety organizations, along with their primary campaigns and calls to action. On our Strategies page, we’ve pulled back the curtains to reveal our strategic roadmap, along with a series of national campaigns. If you’d like to support our efforts with your time, talents, connections, or finances, please do so through our Contribute page. #VoteBloodMoneyOut / #VoteGunSafetyIn is a social media campaign designed to raise voter awareness and education about where the candidates they are considering voting for stand on gun safety issues. In addition to providing a centralized resource of the 450+ candidates that are endorsed by one or more of the national gun safety organizations, this website provides extensive sharing tools that allow everyone to make an impact far beyond their single vote. By sharing the Candidates, Memes, and Videos on the website, everyone can help their family, friends, and neighbors align their votes with what’s important to them. The March for Our Lives in Parkland, Florida. Photo taken by the creator of Action for Gun Safety. There won't be a tomorrow for the 96 people that will die from gun violence in America today. As the students say... Thoughts and prayers are nice, but they’re not enough. We need Action. Do you want gun safety? You know you don't get something for nothing - especially in the face of such fierce opposition to our efforts. Please generously offer your time, talents, connections, or finances to our collective effort. Together, we have all the resources we need if everyone contributes. What are you willing to Contribute to achieve what you say you want? A student leaves a flower for her dead friend in Parkland, Florida. Photo taken by the creator of Action for Gun Safety.